There are two animals that get extra special love and attention around here. One is a duck - which has been my nickname for as long as I can remember....And the other is a bear, which is what I call my favorite person on this planet - my hubby. So today's little project is super special to me since bears of all sorts are very near and dear to my heart. This little bear particularity reminds of the one I love so much...Extra cuddly and sweet and so very love-able. To start, I used some white cardstock for the base, and a little bit of dotted vellum for the background. For the top of the card, I added a beige twill ribbon, and a lace bow, along with a crystal star pin. Just below that, I tucked in a fussy cut stamped evergreen garland from PTI's Love Lives Here: Holiday stamp set, stamped in Pinefeather and Scarlet Jewel ink from PTI. Just below, and as a focal point, I used Close to My Heart's Jack stamp set to stamp and cut the little bear and the heart he's holding. 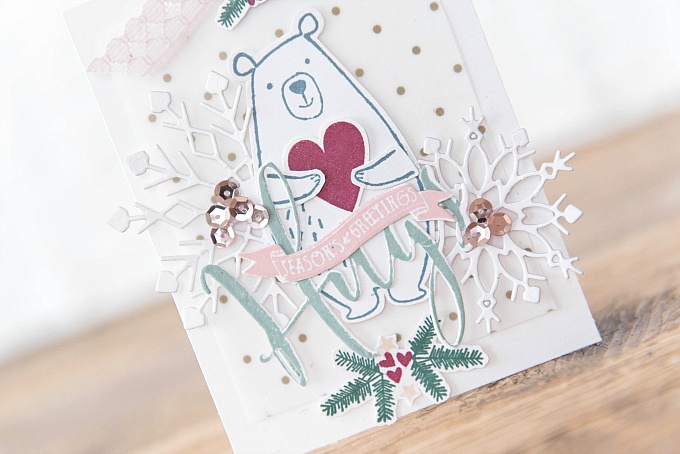 On either side, I tucked in a snowflake, cut using PTI's Silver White Winters die, along with some sequins. For the sentiment, I used PTI's Big Hugs stamp set and die, stamped in Ocean Tides ink, and the banner sentiment is from this stamp. 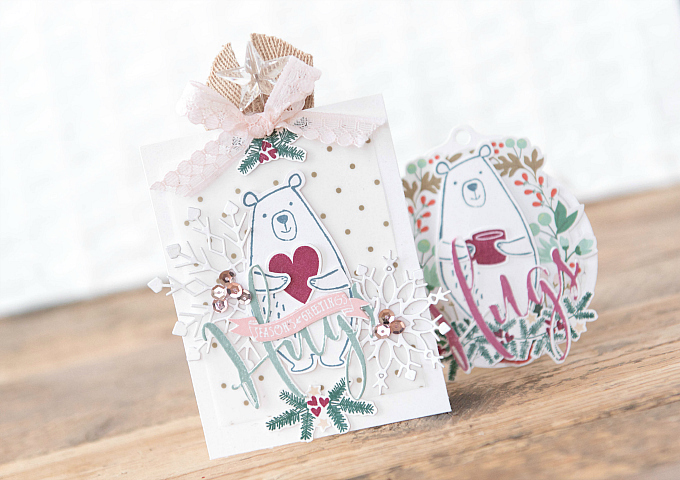 The matching tag is cut using PTI's Tag Sale #4 die, and layered with another fussy cut wreath, little bear and Hugs sentiment! 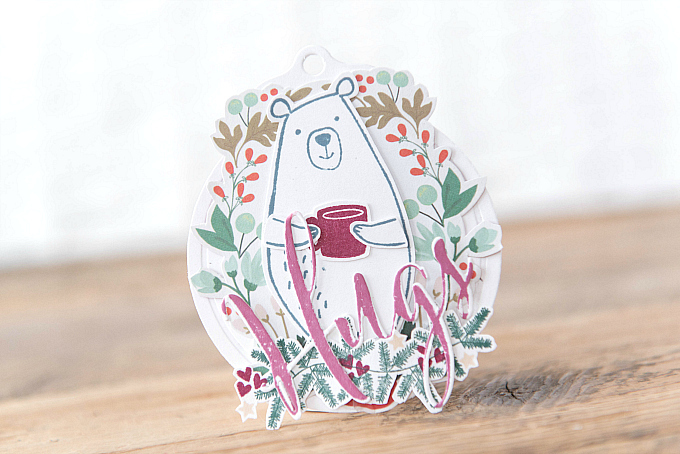 So much fun making these little tags with my most favoritest cuddly bear. I love all of the extra special attention you pay to detail! These are just delightful! Aw, thank you so much, Lisa! I so appreciate your visits and sweet comments! :) Sending hugs! 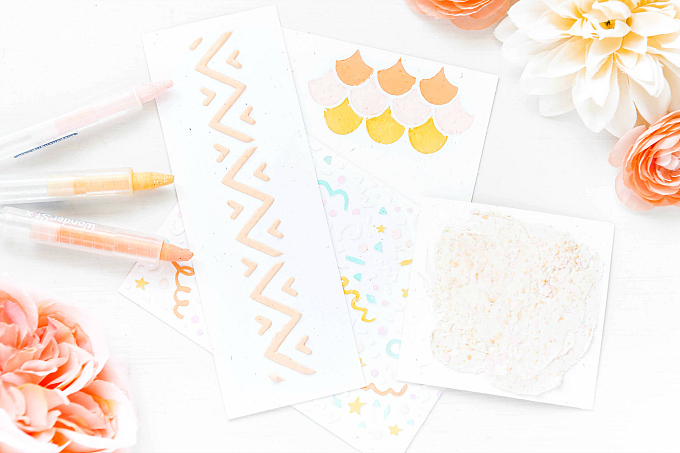 What adorable projects!! The addition of the pink is just amazing. I also like your use of the sequins. Thank you so much, Nora for visiting and for your sweet comment! Isn't pink super fun during the Holidays?! I love the soft, vintage tone it gives projects :) Sending hugs!